Everyday, more and more people are waking up to the realization that not all personal care products are created equally. Just because something says “all-natural” on the label, doesn’t necessarily mean it is natural or healthy. Obviously, not everyone is concerned about store-bought products. However, there are many people who are very concerned about certain ingredients found in their personal care products and their unintended side effects in the human body. My goal is not to convince the world that spreading an amalgamation of unpronounceable chemical compounds on your skin is potentially harmful. We all have to make our own choices in life based on the facts and research that we conduct for ourselves and our loved ones. My goal is to provide easy, straight forward recipes to people who are interested in making personal care products the old fashioned way. In my opinion, it is not enough that the personal care products avoid certain harmful ingredients, I want these products to have health benefits as well. 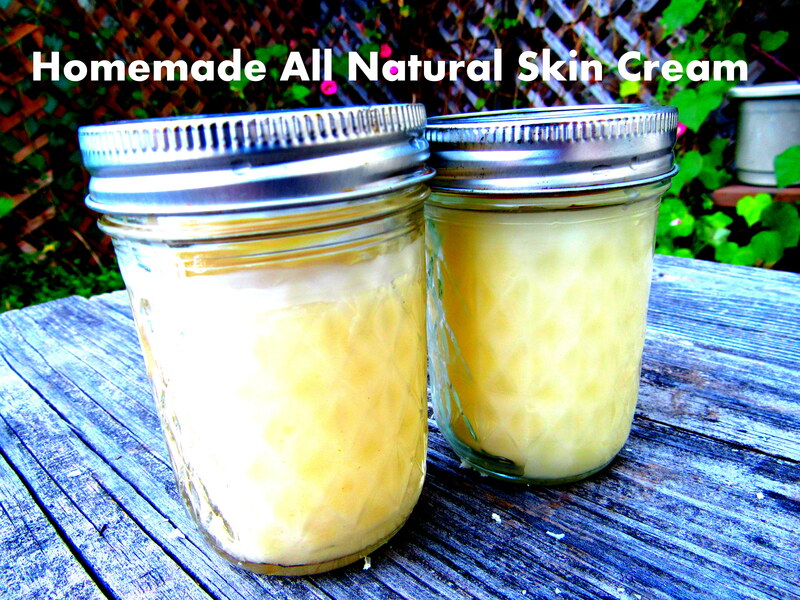 This homemade skin cream is a great example of a basic everyday product that can be made very simply with a few health boosting ingredients. Skin cream is an important part of keeping skin moisturized and helps with anti-aging and wrinkles. However, the benefits of this skin cream are more than just helping your skin feel moisturized. The March 2007 issue of the Journal of Cosmetic Dermatology reports a study that states that applying almond oil to the skin will not only protect it but can also reverse damage that may have already occurred. Almond oil has emollient properties, which gives it the ability to rejuvenate and soften the skin, thereby evening out the skin tone and improving the complexion. 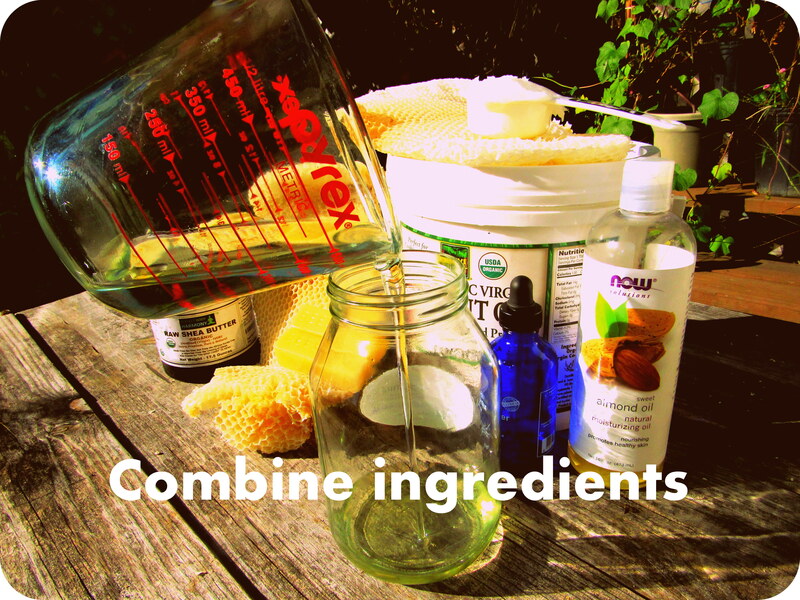 Beeswax, when blended into cold creams and other skin lotions, forms a protective barrier on the surface of the skin. This barrier provides a film of protection against irritants while still allowing the skin to breathe. 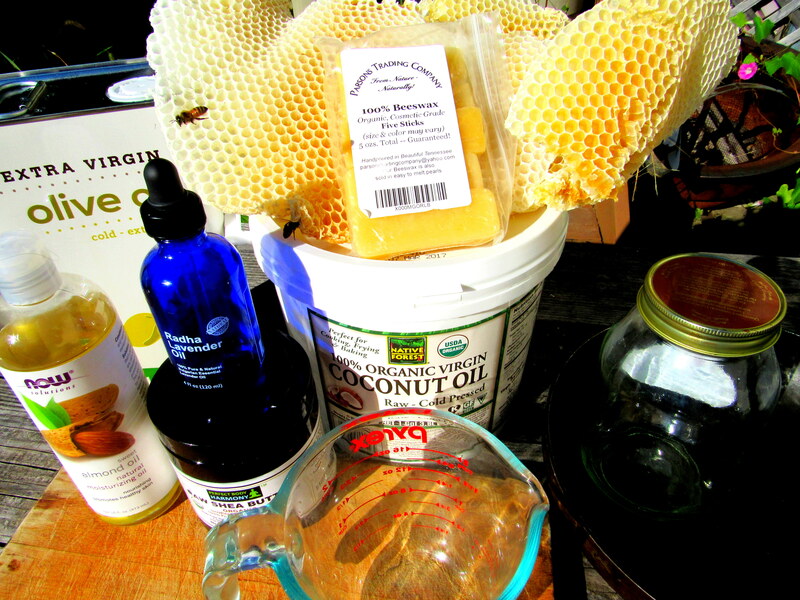 Creams and lotions that contain beeswax are especially beneficial to people who suffer from dry, rough skin. Lavender oil has a particularly clean smelling aroma which makes it a great choice for personal care products. Among its numerous benefits, lavender essential oil is known as an effective oil in treating acne because it inhibits the bacteria on skin and can reduce the signs of scarring after the acne has begun to heal. Adding a small amount of lavender essential oil to other skin creams or ointments can greatly increase the potential for relief and healing. 1. 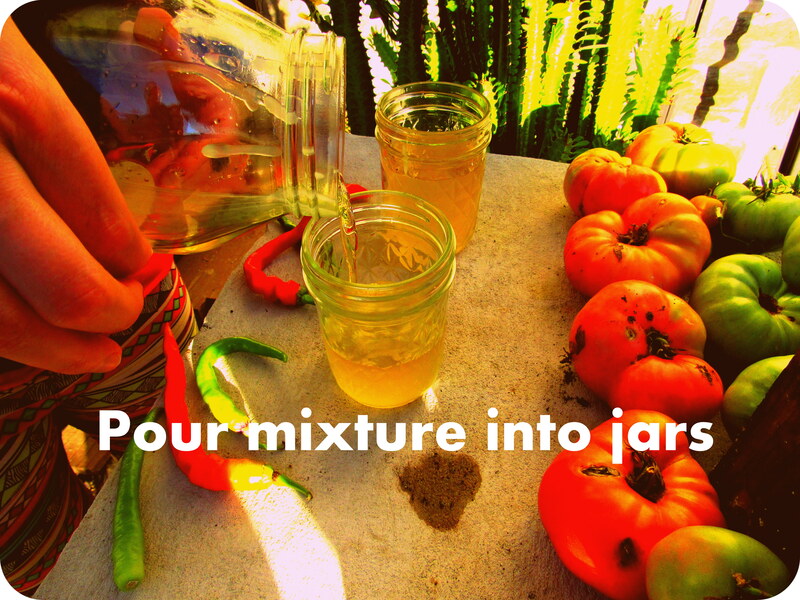 Combine ingredients in a pint sized or larger glass jar. I used an extra large mason jar. 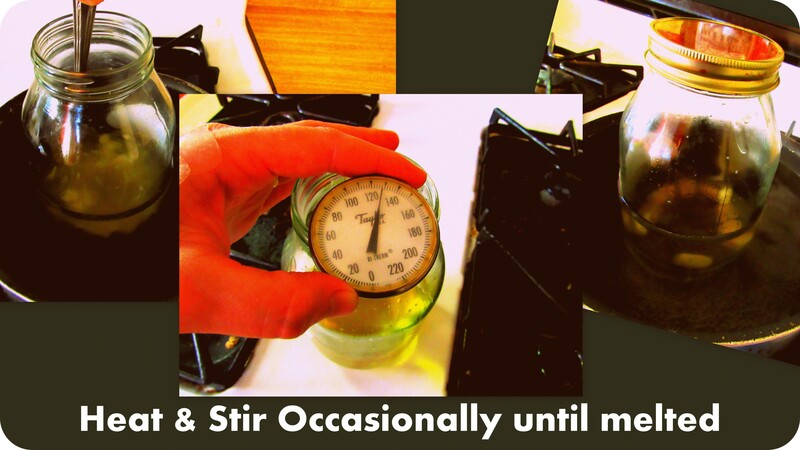 Any type of glass container will work, you can even reuse a glass jar from pickles, olives or other foods. 3. Place jar in the pan with the water and put a lid loosely on top of jar. 4. 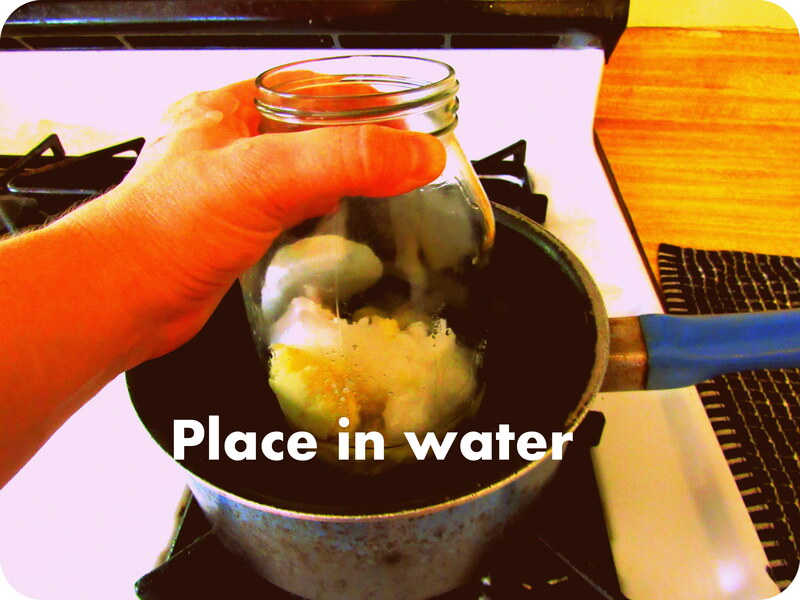 As the water heats, the ingredients in the jar will start to melt. Stir occasionally to mix ingredients together. The beeswax takes the longest to melt with a melting temperature of about 145° F.
5. After all the ingredients are liquefied, remove the jar from the sauce pan and pour into containers. Small mason jars (8 ounce) are great for this, but smaller containers work well too. Because this skin cream is more of a body butter consistency, it will not pump well in a lotion pump. Use as you would regular skin cream or lotion. This has a longer shelf life than some homemade lotion recipes since all ingredients are already shelf stable and no water is added. Use within 6 months for best moisturizing benefits. A little goes a long way with this super moisturizing skin cream! This cream is incredibly nourishing and gentle so it is also great for diaper rash on baby, for eczema and for preventing stretch marks. It also works great on chapped lips. The best part is that this recipe is super easy and the whole process can be completed in under an hour. You can customize this recipe by adding different essential oils, infusing your oils with herbs first, or by using Shea or cocoa butter in place of the coconut oil for an even creamier consistency. Lis-Balchin, Maria (Ed.). Lavender: The Genus Lavandula. New York, NY: Taylor & Francis, 2002. Fantastic. My husband was just asking me to find him a recipe for his face. Thanks!